The information that you will access is provided through official State of West Virginia sources, so it should be considered extremely trustworthy and reliable. 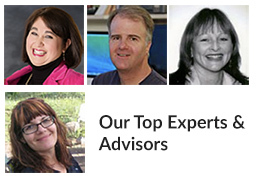 First, we’ll answer a very common question we receive about Assisted Living in West Virginia. 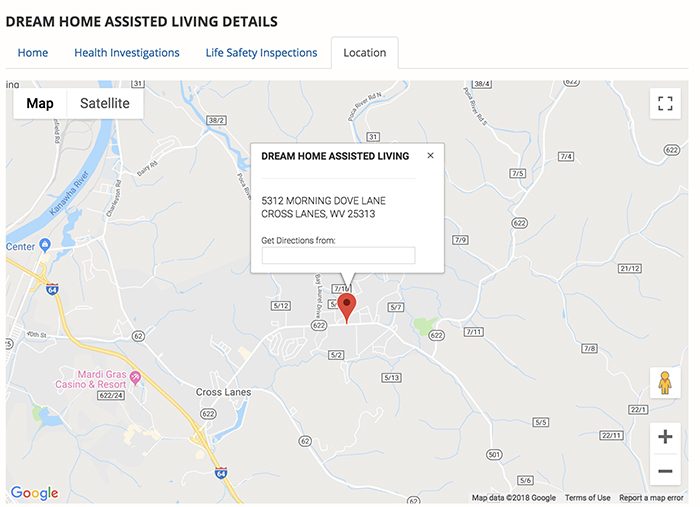 The State of West Virginia’s Department of Health & Human Resources has a section that provides data on all licensed senior care homes and communities statewide. 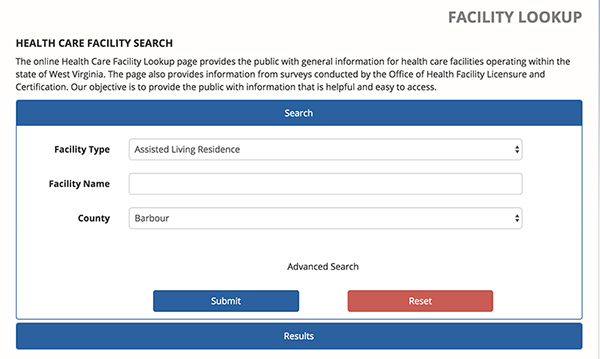 This Facility Search tool can be found on the Office of Health Facility Licensure & Certification page. 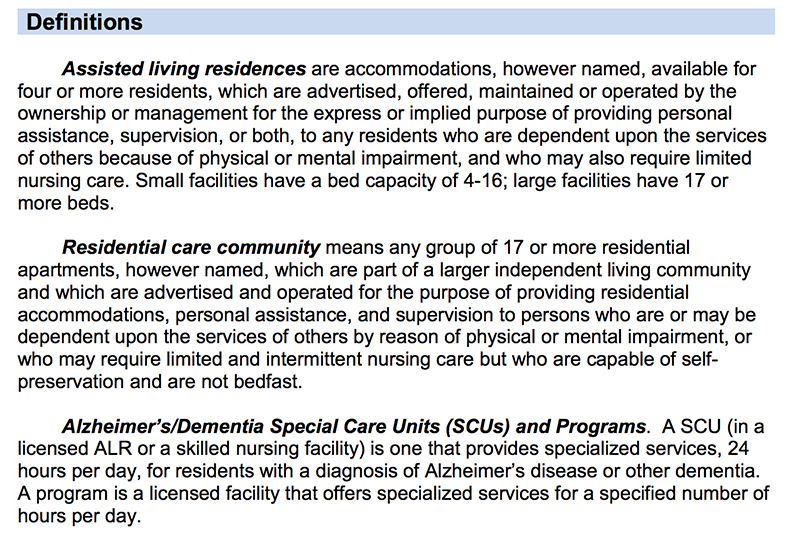 How the State of Virginia defines Assisted Living Residences and Residential Care Communities is unique from other States. They type of data provided through the DHHR Facility Lookup Tool is in-depth, and extremely useful if you are conducting facility research. 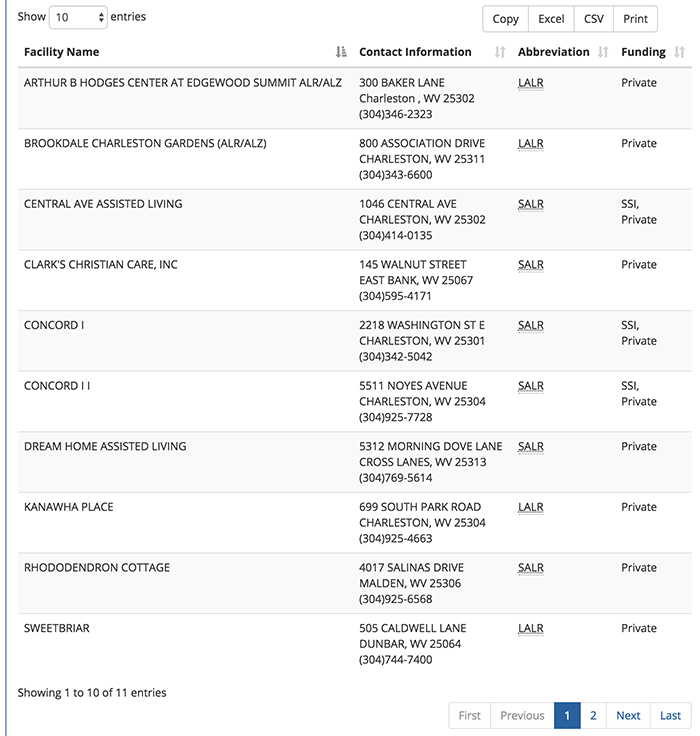 For example, doing a search for Assisted Living Residence for the Facility Type, and then choosing a county, you’ll be greeted to a list of all facilities of that type within that county. 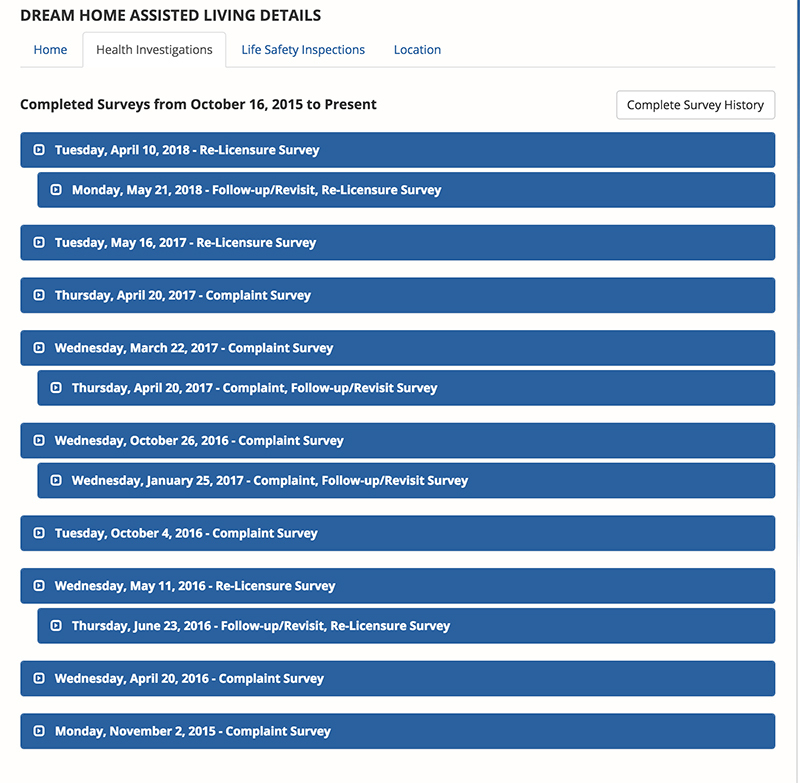 A very useful and important tab/section included with each facility’s details is a Health Investigations summary and Completed Surveys. You are able to click on each report for further details about the investigation, survey or complaint. The next section offers information and reports relevant to Life Safety Code Surveys and Health Inspections. 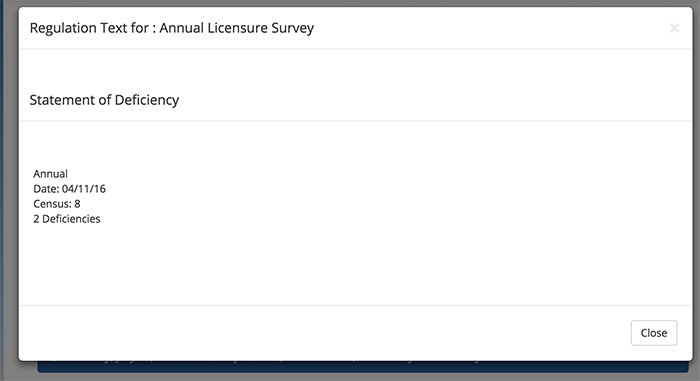 Again, the page lists each inspection or survey in reverse chronological order, whereas you may select an individual report to view details specific to that survey. The details page will tell you how many deficiencies were found. As we all know, Senior Living facilities will always put their best foot forward in their brochures and marketing materials. It’s safe to say that almost never will they put the results of their inspections or complaints records on their websites or in their glossy pamphlets. Allowing the public direct access to this information provides a way for consumers to assess how well each facility is operated and managed. This is not to say every facility has to be, or will be perfect all the time. Things happen and issues come up. However, what I would suggest is most important is HOW the facility responds (and how quickly) to issues and complaints. This information offers you the foundation for asking direct, and constructive questions about the facility, and how it is managed and run. This Facility Lookup tool offers a map of the facility’s location, with a balloon, or window that allows you to get directions from wherever you are, to the facility. I always like to look at the map of the facility’s location. You can really get in close with google maps, and look at what is in the area in terms of Health Care, Dining, Shopping, Parks and More. If you have the time, you can take the mapping experience an extra step to the Street View feature provided through Google Maps. To do so, take the little orange “man” in the left side of the map (just above the plus and negative zoom in/out signs), and drag that “man” onto the map. You should be able to select the street in front of the facility. From there, you should be ‘virtually escorted’ to the street, and by clicking the arrows overlaid on the map, you can ‘drive’ around the area where the facility is located. 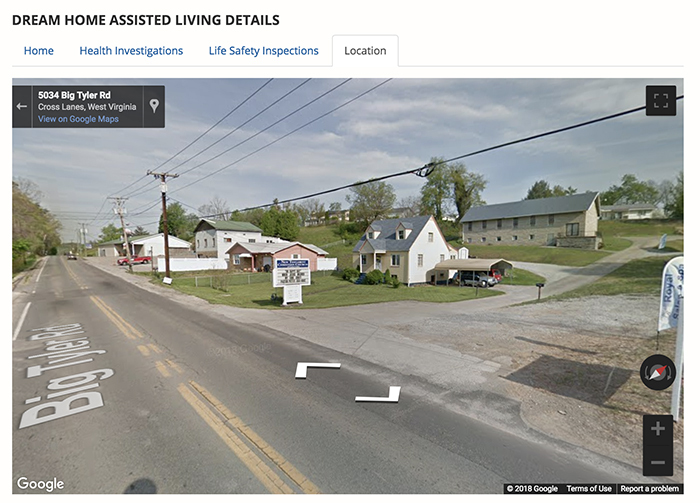 West Virginia is one of the very best states to research Assisted Living & Senior Care Options in. The State of Virginia offers a great number of databases and resources freely accessible to the public, thereby allowing you to bypass the typical commercial senior care site that often times omits important information, or are infrequently updated.